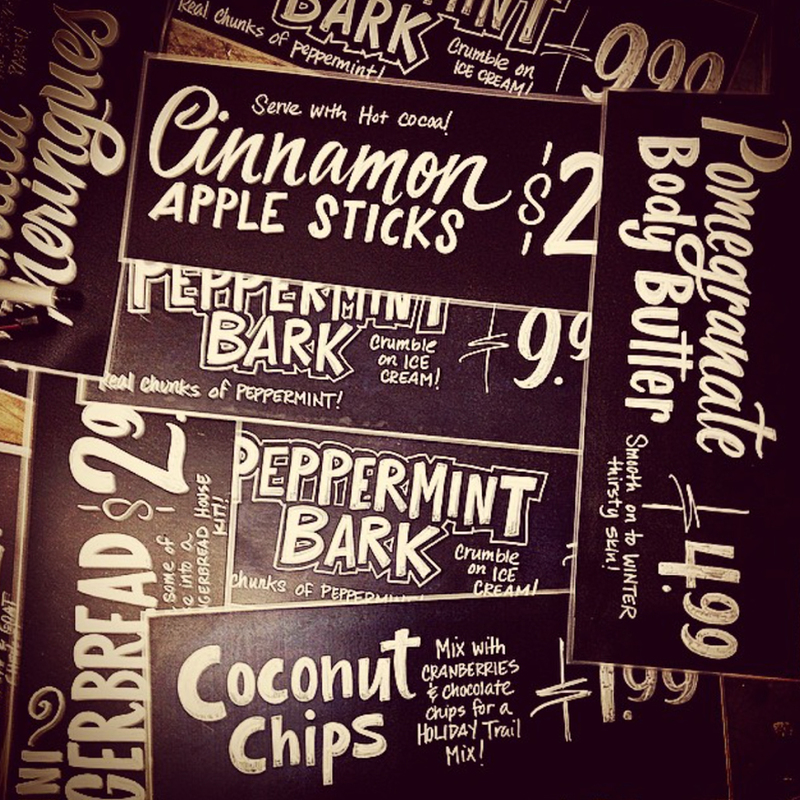 When I was hired to be a sign artist at Trader Joe’s first Austin location, I had no formal training in design other than being a public school art teacher. There were four full-time artists at my store, and more than enough work for all of us. We were also regular members of the crew, and spent about a fifth of our time doing tasks like organizing carts and manning the register. I had to make signs that someone could read at the same time they were pushing their cart. I learned to simplify my work a lot. More than beautiful art, customers respond to signs that are clean and bright. Every ‘shelf sign’ had three components: the name of the product, the price, and a fun fact like "pairs well with cocoa." At first I felt like I was dumbing my signs down, but this actually made them function so much better. When I added lots of detail it would look good, but it wouldn’t fit the purpose of the shopping aisle. Price was a third of each sign to make it easiest for the customer to read. A lot of artists see their art as precious, but you can’t get hung up with that when your goal is to convey information. Signs would take hours to make, only to be erased the next week. I learned to put myself in the client’s shoes, and that’s made me a better designer. In sign-making, you have to let the audience dictate the design. Trader Joe’s really thinks of itself as a neighborhood store. As the first Trader Joe’s store in Austin, we would make references to the city’s rich tech culture, ‘hipster’ reputation, and die hard commitment to the Texas Longhorns. The first Christmas that the store was open, we turned the candy and cookie shelves into gingerbread houses and the frozen section into a frosty forest. It was magical– and the customers loved it. Most Trader Joe’s branches function pretty independently. The store Captain does a lot to determine the culture of the store. (I really think ours could have been a Creative Director in another life.) Pretty much every sign you see in a Trader Joe’s is hand done. Periodically, Trader Joe’s will revisit the role of sign artist. The fact that they keep investing in original store art makes me think they see it as part of what makes the brand so popular. Becca Borrelli is an admirer of doodling, lettering, and art teaching. Since graduating with a MA in Art Education from The University of Texas, she has been working as an art teacher at The Contemporary Art School in Austin, and establishing an illustration and sign making business. You can learn more about Becca at her website. Article as told to Daisy Alioto.